While the market voted to send Clean Energy's shares down sharply following third quarter earnings, the business looks to have actually come out of the quarter in better shape than it entered it. Welcome to the difference between GAAP and cash accounting. Following natural gas for transportation leader Clean Energy Fuels Corp's (NASDAQ:CLNE) third quarter earnings release after market close on November 3, 2016, Mr. Market blistered the company's stock, sending its shares down almost 18% on November 4. It must have been a terrible quarter, right? After all, the company only grew revenue 5% in the quarter, short of Wall Street expectations, and also reported a net loss of $12.6 million, a disappointment after delivering GAAP profits in the two prior quarters. But calling Clean Energy's third quarter a bad one simply based on the top- and bottom-line results doesn't tell the whole story, and ignores the very real progress the company continued to make in improving its balance sheet, growing fuel sales, and better-managing its expenses. Redeem has become a major part of Clean Energy's growth story. Image source: Clean Energy Fuels. Let's take a closer look at Clean Energy's financial and operating results, and focus on the most important things investors should know. Growth may have slowed -- or did it? One of the challenges with Clean Energy is measuring the company's "real" growth. Part of the catch is that the majority of its revenues come from fuel sales, and fuel prices can swing wildly as we have seen over the past two years. But at the same time, its per-gallon margins have actually increased slightly even as fuel prices have fallen. In other words, pure revenue results can sometimes mask whether the results were "good" or "bad". In millions. Data source: Clean Energy Fuels Corp.
As you can see, CNG grew at nearly a double-digit rate, while LNG and RNG both saw declines. But, according to management, it wasn't falling demand from transportation customers to blame. On the earnings call, management described two factors that played a role in the numbers above. A large 1-million gallon bulk sale of LNG in last year's third quarter that wasn't repeated this year. So LNG sales to transportation customers were flat YoY. The company is selling more of its RNG as "Redeem" which is categorized under CNG or LNG. The remaining volume under RNG is sold to utility customers. Total Redeem volume -- much more important than RNG sales to utilities -- has increased 20% year-to-date. When adjusted for the one-time LNG bulk sale, and remove non-vehicular RNG from the calculation, total gallons delivered to core transportation customers increased 7% year-over-year. Through the first nine months of 2016, Clean Energy Fuels has reduced its long-term debt by $219.8 million -- a whopping 43% reduction. The majority of that -- $136.2 million -- was paid off in the third quarter. At the same time, the company finished the third quarter with $119 million in cash and short-term investments, down $27.8 million from the beginning of the year. Cash and short-term investments was down $62.7 million from $181.7 million at the start of the third quarter. Through the first nine months of 2016, Clean Energy Fuels has raised $67.4 million by selling 21.33 million shares of newly issued stock. $72.1 million in convertible long-term debt retired in exchange for 20.3 million shares. $143.2 million in long-term debt repurchased for $124 million in cash. $67.4 million in cash raised from 21.33 million new shares issued and sold under company's "at-the-market" program. 44 million in cash from operations YTD. Put it together, and the company enters into the last quarter of 2016 with plenty of cash and significantly less debt than it had at the start of the year, but at a pretty substantial dilutive cost to shareholders. Between shares issued and exchanged for debt and shares issued and sold to raise cash, there are some 40% more shares outstanding now than there were at the start of the year. Selling, general, & administrative expense was $25.9 million in Q3, down 7% YoY. So far in 2016, SG&A is down 12% -- $10.3 million less than the same 2015 period. Net interest expense was $6.3 million, down 38%. Some of this was non-cash, but cash interest expense should be down around 30% from the peak, based on debt retirement. Capital expenditures on track to be $25 million for full year, less than half of 2015 Capex spend. Combined with the steady rate of growth in fuel sales, as well as improved margins largely tied to growth in sales of Redeem, Clean Energy's brand name for its renewable natural gas, Clean Energy has reached a state where its operations generate enough consistent cash flows to cover all of its cash operating expenses. And while understanding cash flows is important for every company you invest in, it's more than essential for investors in Clean Energy Fuels for one reason: Depreciation and amortization. Let me explain. Clean Energy has spent more than $400 million on capital expenditures over the past five years, with nearly all of that investment in long-lived assets such as the equipment at its refueling stations. And while the cash is spent, the tax benefit of that investment shows up on the company's books every quarter in the depreciation & amortization line item. So far this year, the company has had $87 million in depreciation & amortization expense, up 13% from last year. But since this is a non-cash expense, it doesn't really hurt Clean Energy's balance sheet. To the contrary, the company benefits from this large expense, since it leaves the company with more cash on hand since its profits -- and the tax it would have to pay on them -- are reduced. Bottom line: GAAP accounting is important, but at Clean Energy's current phase of high depreciation & amortization, it's handy to measure its results with adjusting for this non-cash expense. Relative to where it was a year ago, Clean Energy Fuels has made a lot of progress. 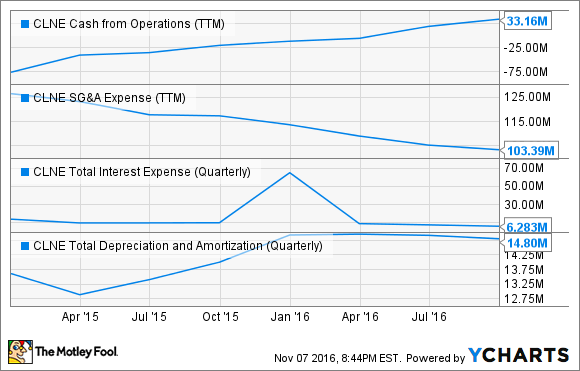 Its debt load is significantly lighter, cash expenses are down across the board, and there continues to be steady (if not strong) growth. Because of the improved cost structure and reduced debt, the company has finally reached a point where it can live within its cash flow. As important, its existing capital assets will support significantly higher fuel sales with only minimal additional spending. The company expects to finish 2016 having built more than 60 stations, which would be the second-highest ever, and CEO Andrew Littlefair indicated that they are expecting similar station activity in 2017. The catch is, the majority of this growth is coming in the solid waste and public transit sectors, as CNG continues to be very price competitive versus diesel, while natural gas' cleaner tailpipe emissions are beneficial in urban and metropolitan areas. And while this has remained a bright spot, heavy-duty trucking -- particularly LNG -- adoption has largely stalled with diesel prices down so low. Put it all together, and Clean Energy Fuels has made major strides to strengthen the business for the long-term. The recurring nature of its revenues will help it continue riding out the current oil price environment -- even if growth isn't particularly strong in the near-term.